If you don't have any version number on the Chapter Selection Screen you also need to update! v2.1 28-7-2011: Created a Chapter Selection screen at the start! v3.1 29-7-2011: Fixed the "The whole game crashes after saving the first guy"-bug! v5.0 31-7-2011: Finished the final chapter, everything is done now! v5.3 23-8-2011: Fixed a lot of bugs and some language errors. Dinoquark and mint301: Thanks for finding them! v5.4 24-8-2011: Added a version number on the level selection screen, so it's easier to check if you're up to date! at the top of the room "EVERYTHING" i died a lot, apart from that didn't have too much trouble. i got past it, so it isn't too hard, but if you're not going for a challenging level it could maybe be a little easier? I'm not very skilled at platformers so what seems quite hard to me might be fine for most players! I just finished Chapter 2, and I updated the download link! Cool level, I enjoyed it. I wish there was a way to skip to the beginning of a certain chapter. Maybe release each chapter as separate files? I created a chapter selection screen at the beginning where you can choose where you want to start! Worked until 3 AM -Dutch time- on Chapter 3, and I think it turned out great! 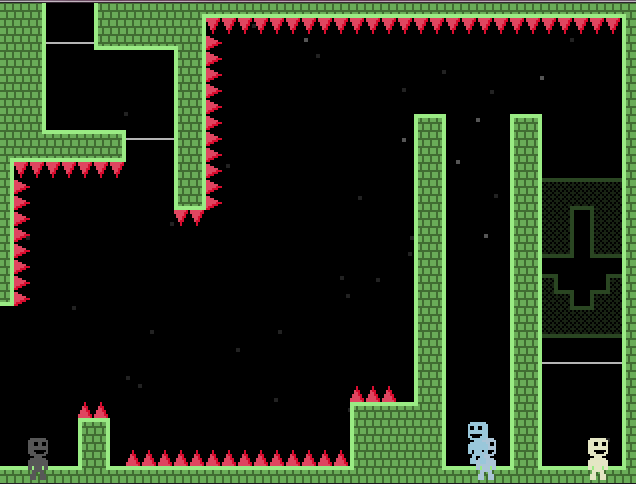 I don't mind as i'm actually pretty good at VVVVVV and got through the first levels pretty easily so i will just restart and go back to that spot. Just pointing it out to you in case you can fix it. I think it had something to do with the "Congratulations you saved a Crewmate" Dialouge overlapping the "Blue smiled" dialouge. Ok every level i play is glitched now even the campaign cutscenes. Every level has those four ghost men. And i can't move. Hmph. EDIT: I reinstalled and played the level again and the exact same thing happened once i got the Crewmate :/. I played it and you were right about the problem, it was the two dialogs overlapping. I made some changes and now it works fine again! I ran into another glitch after saving Mario. I went back down into the room he was in and some text got frozen on the screen and pressing action does nothing. No ideas how to solve this one :/. I will start from chapter 2 although so hopefully it will be ok.